What Sharpening Stone do you Suggest For Flattening the Backs of Woodworking Chisels? When sharpening woodworking chisels, it is important to have a flat back on the chisel. If the chisel's back is not flattened and polished properly, you will not be able to get a truly sharp edge. The need to flatten the back of chisels presents an important consideration when selecting sharpening stones. 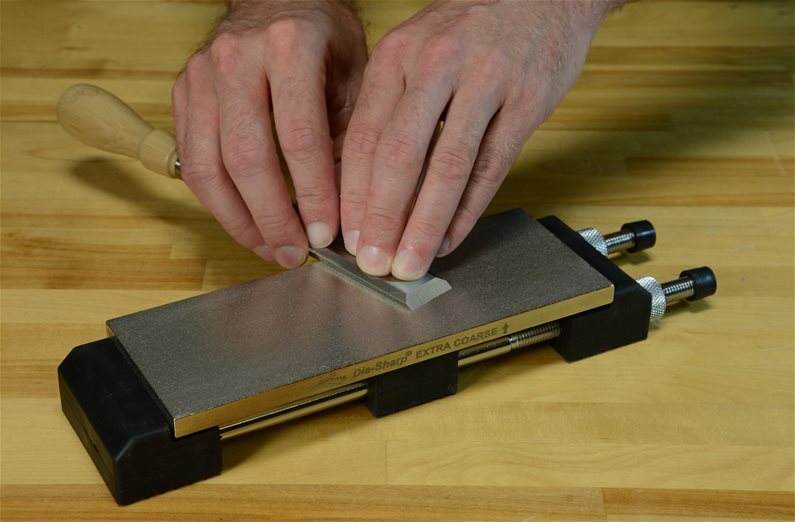 So what attributes make for a good chisel flattening stone? When selecting a stone, flatness is important. It is very difficult to create a flat surface on a chisel by using a stone that is not flat, so a flat flattening stone is critical to achieving a flat chisel back. Look for a stone that remains flat or which is easily made flat. It is important to have a progression of grits. This operation is about removing metal to create a flat surface. Using too fine of a grit will take exponentially longer, result in frustration, and ultimately just not get the job done. Look to start with a stone in the 220-400 grit range. If your chisel is already really flat, you can skip this step. After you've established the the initial flatness, it is important to continue to polish the back with finer grits. The edge of a chisel is determined by the two sides of the edge, the bevel and the back. It is easy to forget that the back of the chisel is just as important to finely sharpen or polish as the bevel. We recommend at least 2 or 3 more grits to get all the way to a polished edge. Common examples of finer stones would be 600-1000, then 3000-5000 and finally ending with 6000 - 12,000. The finer the stone, the sharper the edge. A large stone that allows long, smooth strokes when flattening a chisel back is easier to use than a small stone that forces short, choppy strokes. Look for a stone that is at least 8" in length. Diamond stones and water stones are the most popular stone for woodworkers. Both types are effective at flattening the backs of chisels. We explain the benefits of each stone below. Diamond stones are ideally suited for any task that involves flattening. Diamond stones start out flat, and unlike other stone types, they stay flat. This property of maintaining flatness means every time you grab a diamond stone, you can be confident that it will be flat. The DMT line of diamond stones works well as a starting point. These stones start at 220 grit, an ideal starting point for flattening the backs of chisels. Water stones sharpen quickly and come in the coarse grits required for flattening as well as many grits during the polishing stage. Water stones do require flattening, so there is an additional step compared with diamond stones. The coarser grits require flattening more often than the finer grits. Flattening a water stone is much easier than other types of stones, see our page on How To Flatten a Water Stone for more information on the procedure. The 8" Dia-Sharp Kit from DMT is an excellent choice for sharpening chisels and is especially good for flattening. The stones are very flat and will remain so with use. The kit contains 4 stones with 220, 325, 600 and 1200 grits. The 8" x 3" size provides a larger surface ideal for woodworkers. 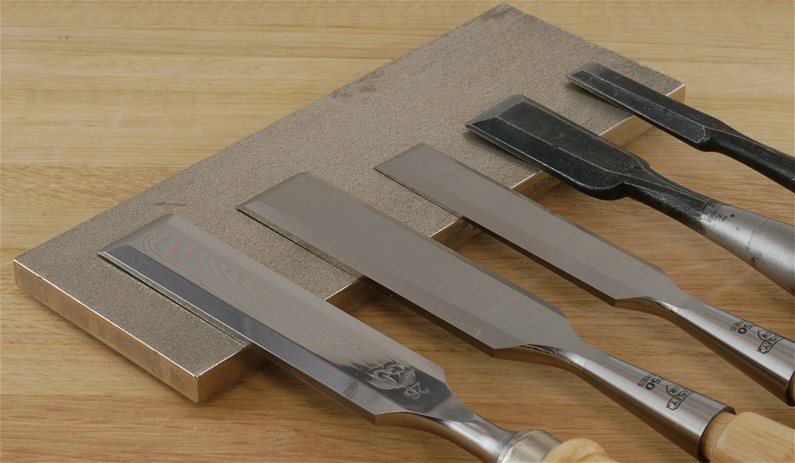 The Naniwa Super Stone Set is a wonderful set of water stones for sharpening chisels and flattening the backs. This high quality set of stones puts an amazing finish on woodworking tools. This set includes 220, 1000, 5000 and 10,000 grits. The Norton Water Stone Kit is a complete set at a very reasonable price. It contains a 220/1000 stone, a 4000/8000 stone as well as a flattening stone. Starting with the right stones will make it easier to flatten the back of a chisel. The process takes time, so the right stone will help you achieve the flat back necessary to get a sharp edge. The stones required for flattening the back of the chisel are the same stones we recommend for sharpening the bevel, so there is no need to get a different set of stones. 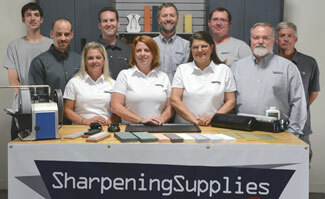 Selecting a quality set of stones is an important decision that will make sharpening and woodworking more enjoyable.